The products resulting from the techniques and processes of biotechnology continue to grow at an exponential rate, and the expectations are that an even greater percentage of drug development and clinically-utilized pharmaceuticals worldwide will be classified as biologics. A recent Pharmaceutical Research and Manufacturers of America report (PhRMA, 2017 industry profile: medicines are transforming the trajectory of disease. Available at http://phrma-docs.phrma.org/industryprofile/pdfs/2017IndustryProfile_MedicinesareTransforming.pdf, 2017) notes that there are currently about 7000 medicines in clinical development globally and 80% in the pipeline have the potential to be first-in-class treatments. Most pertinent to this textbook, the majority of these medicines in development were impacted directly or indirectly by biotechnologies at one or more points during their lifetime via: target identification, and/or lead identification, and/or lead optimization, and/or clinical development and evaluation and/or product production. Pharmaceutical biotechnology techniques are at the core of most methodologies used today for drug discovery and development of both biologics and small molecules. While recombinant DNA technology and hybridoma techniques were the major methods utilized in pharmaceutical biotechnology through most of its historical timeline, our ever-widening understanding of human cellular function and disease processes and a wealth of additional and innovative biotechnologies have been, and will continue to be, developed in order to harvest the information found in the human genome. These technological advances will provide a better understanding of the relationship between genetics and biological function, unravel the underlying causes of disease, explore the association of genomic variation and drug response, enable personalized and precision medicine, enhance pharmaceutical research, and fuel the discovery and development of new and novel biopharmaceuticals. These revolutionary technologies and additional biotechnology-related techniques are improving the very competitive and costly process of drug development of new medicinal agents, diagnostics, and medical devices. 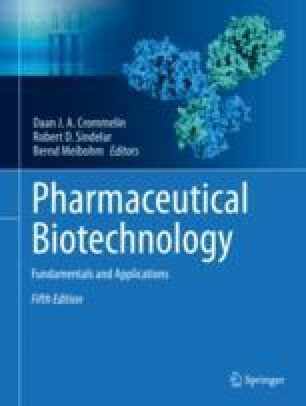 Some of the technologies and techniques described in this chapter are both well established and commonly used applications of biotechnology producing clinically-utilized medicines as well as potential therapeutic products now in the developmental pipeline. New techniques are emerging at a rapid and unprecedented pace and their full impact on the future of molecular medicine will turn dreams into realities. I wish to acknowledge the tremendous contribution of Dr. Arlene Marie Sindelar, my wife, to some of the graphics found in figures in all five editions of this textbook.